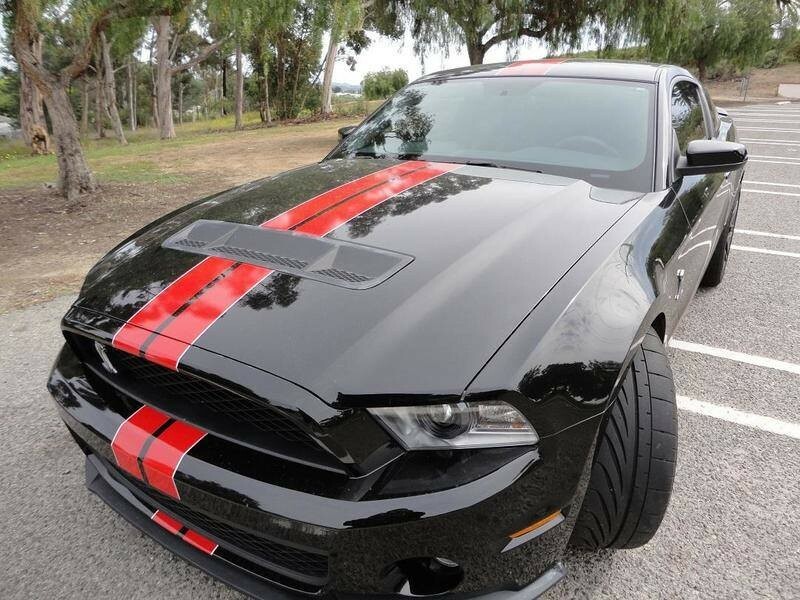 Now available by The Motor Masters is a 2012 Ford Mustang Shelby GT500 for sale. This 2012 Ford Shelby GT500 granted most Mustang enthusiasts’ wishes: more power, less weight, and better performance. And this one, with a supercharger under the hood, is lighter on its feet than its predecessors, and transformed what was merely a fast Mustang into a legitimate Corvette competitor. This 2012 Ford Mustang Shelby GT500 shows just under 10,000 original miles, and is one of the nastiest Mustangs we’ve ever featured. Dressed in black with red stripes, it’s downright predatory. On a side note, notice the revised front fascia fits tighter, the air intakes are slightly larger to improve cooling on the track, and a relatively subtle rear spoiler. Of course, nobody will mistake this with any other Mustang, thanks to the big chrome SHELBY block letters on the front and rear, as well as the unique grille opening and pavement-hugging chin spoiler with splitter. The original owner of the car has tinted the windows, which is probably a nice perk for a car with a black and red leather interior, and it looks downright brutal with matching black Shelby wheels. This is a beautiful 2012 Mustang Shelby GT500. It was originally purchased as an investment. However, it is now available for sale. The pristine GT500 Shelby comes in black with red “colorado stripe” and a silver edge. The Ford Mustang GT500 has matching black/red interior. It is a 6 speed, 5.4 liter supercharged V-8. All the options including the navigation package are present on this Shelby GT500. The odometer reads at under 10,000 miles and it is still under factory warranty! The original window sticker goes with the car. So if you are looking for a pristine Ford Shelby GT500 that is fairly new with low mileage that you can drive and enjoy, this is it. Priced to sell, so this one won’t last. Give us a call TODAY!